Long-awaited rules that regulate the fat, salt, sugar, and calories in snacks and vending machine foods sold in schools were finally released by the U.S. Department of Agriculture today. The rules take effect during the 2014-15 school year. Nutrition advocates have been pressing the USDA to issue the rules this month. Any later, and they wouldn't have taken effect until the 2015-16 school year. The new rules are the first update to school snack regulations since the 1970s. The existing rules only limited "foods of minimal nutritional value," which didn't keep candy bars, snack cakes, and sugary, vitamin-fortified sports drinks, from being regulated, said Margo Wootan, director of nutrition policy at the Center for Science in the Public Interest. Despite some high hopes for the rules, which come on the heels of strict rules for school lunches, they won't completely wipe out sodas, chips, or sweets from schools. But they will make a dent. "Millions of students currently have widespread access to snacks and beverages that are high in sugar, fat, and salt, but limited access to nutritious options such as fruits and vegetables in school stores, snack bars, and vending machines," said Jessica Donze Black, director of the Kids' Safe and Healthful Foods Project. "With many students consuming up to half of their daily calories at school, these new standards represent the kind of positive change we need to help reduce obesity rates among children and teens." Many of the rules are adapted from those that were originally proposed by the agency, which received about 250,000 comments. What happens if schools don't comply? Agriculture Secretary Tom Vilsack said he hopes schools do, though there aren't explicit penalties if they don't, unlike rules for the school lunch and breakfast programs. "It's not about carrots and sticks," Vilsack said, then paused. "Well I guess it is about carrots." Vilsack said he hopes and believes the rules will be embraced because, combined with lunch and breakfast regulation, send a consistent message to students and address the same problems, hunger and obesity. The changes will make "the healthy choice the easy choice for all students, no matter where they live in America," said Mary Story, a professor of epidemiology and community health at the University of Minnesota. All snacks and vending machine foods must be either a fruit, a vegetable, a dairy product, a protein food, whole-grain-rich or a combination food that includes at least a quarter cup of fruits or vegetables. For the first two years after the standards take effect, foods qualify if the items contain at least 10 percent of a nutrient designated as public health concern for children. These include calcium, potassium, vitamin D, and fiber. That means after two years, items fortified with these nutrients won't be allowed, Wootan said. "Companies won't be able to just fortify snacks with cheap nutrients to qualify them as healthy; all school foods will have to contain food―some fruit, vegetables, whole grains, or another healthy food component," she said. Any snack or side dish would be limited to 200 calories. Entrées sold individually would be limited to 350 calories. Snacks could have no more than 230 milligrams of sodium, and that cap would drop to 200 milligrams of sodium for the 2016-17 school year. Entrée items must have no more than 480 milligrams of sodium, unless these items are already part of regular school meals. Items can get no more than 35 percent of their calories from fat and no more than 10 percent of their calories from saturated fat. Trans fats are banned. There are exceptions to the fat limits on some items, such as reduced-fat cheeses and nuts. Total sugar must be no more than 35 percent by weight, with exemptions for dried fruits or vegetables. Items sold as entrees in school lunches wouldn't have to meet these rules—which was a concern for some school nutrition advocates. All schools can sell water, carbonated water, plain low-fat milk, flavored or unflavored fat-free milk and soy milk, and juices made only of fruits and vegetables. High schools can sell all of those drinks as well as caffeinated sodas as large as 12 ounces, but they cannot have more than 60 calories. Full-calorie sports drinks won't be allowed. They can also sell flavored and carbonated water as long as these items have less than five calories per eight-ounce serving. After reviewing comments the USDA decided it won't allow side dishes, such as french fries or chips served as part of a regular school meal, to be sold a la carte unless they meet all of the requirements listed here. As originally proposed, the standards wouldn't apply to occasional school fund raising events or during evening and afterschool activities. States get to decide what that means. The School Nutrition Association, which represents school cafeteria managers, said these rules come at a tricky time. "School meal programs are already in the midst of a sea of change as cafeterias work to meet new school breakfast and lunch standards and encourage students to try the healthier choices offered," SNA President Sandra Ford said. Her organization plans to work with the USDA and Congress so that the snack rules "do not present undue burdens on school menu planners and students." 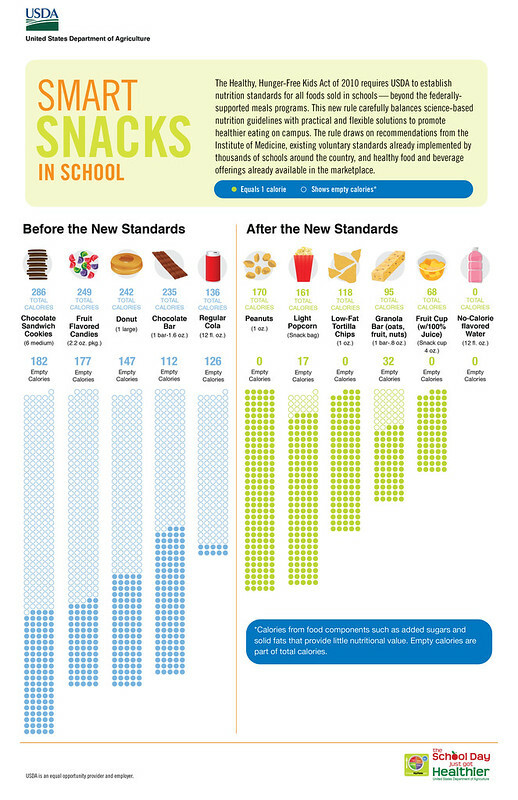 This USDA creation shows what snacks now look like and compares them to what snacks could look like in many schools.